Suzuki GSX-R Motorcycle Forums Gixxer.com > Gixxer Forums > Other Suzuki Forums > Looking at 2008 GS500F - comments? Looking at 2008 GS500F - comments? 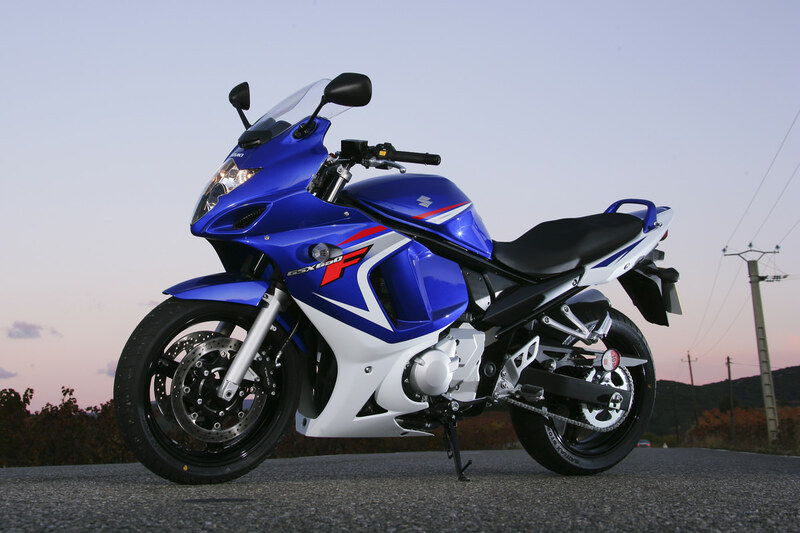 I may go look at a 2008 Suzuki GS500F. The pics show it to be in very nice shape with only 3500 miles. The orig owner is asking $2600, which is a bit on the high side. I know this isn't any kind of rocket. Just looking for a bike to putt-putt around on. Am I crazy? Here is a pic . . .
Re: Looking at 2008 GS500F - comments? I rode one a few years ago and it's not a bad motorcycle. Very comfortable and it has decent power and brakes. The price is probably a little high but being a one owner with low mile means a lot. You might try to get him down a little but if you like the bike that also means a lot. I also like that it has a center stand -- easier maintenance. This is an air-cooled twin with an oil cooler, so one less complication -- but on the other side of that coin -- more susceptible to overheating here in the desert. One thing Nevar, if the tires are original they will need to be replaced and my advice is don't go cheap. Tires are the only thing between you and the blacktop. I run Michelin Pilot Roads but any of the premium brands are alright. I have to say I loved my EX500 way back in the day as in a brand new 1988 bike. It served everything I threw at him from in town to twisties to 500+ mile touring days (Mexico anyone?) but it was liquid cooled. The center stand is a gift as yes, it makes maintenance very easy indeed. You may miss the "twist the throttle" fun factor but they are great bikes. I had a tank bag and saddle bags for those long days out riding or those days leaving in 80F days but returning in 50F nights. Having ridden them before, they have absolutely no draw for me. I'd much rather buy one of the fuel-injected SV650 over these. Or an EX500. Hell, I'd honestly buy one of those Burgman 650s or an Aprilia Mana over one. It's just that lackluster, and putting miles on it is only going to drive its value down drastically. I’ve never ridden the GS-F but another vote for an SV650. I think it’s a much better platform in the same price range as that bike. You might want to consider the GSX650F which replaces the Katana 600/750. Looks like a nice sport touring bike with 74HP, duel front rotors, fuel gauge, liquid cooled, fuel injected, 56mpg, 5 gallon gas tank and some have ABS but no center stand. Just to give you one more option to look out for. I've had my eye on the Suzuki v-twin 650 in all its different models. A good late-model low-mileage reasonably priced bike just hasn't shown up yet. But I'm patient. Rotors that duel? Very cool. That's why I thought it was worth mentioning. Dueling rotors while you take a rest is AWESOME!!! Well, this purchase fell thru. Maybe it's for the best. Thanks to all who responded and answered my questions and to those who had comments.